The Ford Explorer comes powered by a choice of 4-cylinder turbo and V6 engines with optional 4WD. The Explorer offers seating for up to seven, handles well, and offers good safety. 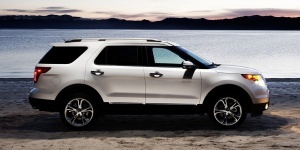 The Ford Explorer is expanded by a Sport trim powered by 3.5-liter Ecoboost V6 for 2013. A knee airbag is now standard on the passenger's seat. Find the used Ford Explorer of your choice from a dealer in your area. Search our used car listings now.